Little is known about the Galloway Terracotta Company. They were founded in 1810 as Galloway and Graff, with a business address on 1725 market street, Philadelphia, PA. Sometime in the later part of the nineteenth century, Graff ceased to be a partner in the business and Galloway moved to Walnut Street. 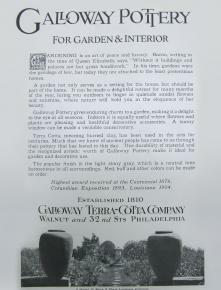 First reference to Galloway is 1876 Galloway Terra-Cotta Company, when they won the Philadelphia 1876 exposition, the Chicago exposition, and the St. Louis Exposition. During that era, Galloway was one of the premier pottery companies in the United States. Interestingly, Galloway worked on Grand Central Station. Unfortunately, that work has since been torn down. Everything Galloway shows in their cataloges are copies of Greek or roman classics. From late 19th to early 20th century, they marketed heavily with leading architects around the world. A terra-cotta fountain, 'Out in the Rain', Galloway & Graff, 1725 Market St. Philadelphia, late 19th century. The figure of two small children under an umbrella, impressed with maker's name. Design inspired by an Italian version exhibited at the Centennial Exhibition in 1876. During the Mission/Arts and Crafts movement Galloway was one of the largest ceramics providers in the country. Likely due to the Depression, records and advertising of the Galloway company began to dimish until the 1940s when information on the company ceases.